Download PDF file or Rich Doc. Format file. This manuscript is a result of many years of careful study and examination of the books of Daniel and Revelation, as well as other related prophecies. Many of the concepts contained in this book will be entirely new to the reader, but in the light of the above statements we invite you to thoughtfully examine the evidence for these conclusions. “The solemn messages that have been given in their order in the Revelation are to occupy the first place in the minds of God’s people. Nothing else is to be allowed to engross the attention.” (8T 302) Daniel and Revelation must be reexamined for a deeper understanding of God’s plan for the last generation. “When the books of Daniel and Revelation are better understood believers will have an entirely different religious experience.” (TM 114) The study of these two books will bring about a true understanding and acceptance of the nature of Christ, and will result in the development of a people who will reflect His image fully. crushing of the image, but extends beyond the 1000 years when the wicked are raised from all previous kingdoms and “the iron, the clay, the brass, the silver, and the gold, are broken to pieces together, and become like the chaff of the summer threshing floors; and the wind carried them away, that no place was found for them; and the stone that smote the image became a great mountain, and filled the whole earth.” Daniel 2:35. The third recorded vision was given to Daniel and is recorded in chapter 7. This vision covers the same period of time as the king’s first vision. It begins with Babylon and closes with the kingdom being given to the saints at the end of the millennium. The “judgment” as recorded in Daniel 7:22 is the judgment of the wicked by the righteous during the millennium. See GC 661. Following the giving of the vision of Daniel 8:2-14 Gabriel returns on several occasions to further explain the original vision. Each explanation given by the angel is a further development of the original vision and terminates at the same point in time. This sequence of vision and interpretation is important and ought not be overlooked. For example the vision of Daniel 8 begins with the Medo-Persian kingdom and closes with the questions concerning the vision of the “daily,” “transgression of desolation,” the “sanctuary and the host to be trodden under foot,” and ends with the plain statement “Unto two thousand and three hundred days; then shall the sanctuary be cleansed.” Daniel 8:13, 14. Daniel is then given his first explanation of the vision as recorded in Daniel 8:17-26. This begins with the angel telling Daniel to “understand . . . at the time of the end shall be the vision.” (verse 17). He is also told that he would be shown “what shall be in the last end of the indignation” (verse 19). See Isaiah 30:27-30; Revelation 14:10.
against the Prince of Princes (Christ); and being broken without hands.” (verse 25). Here is shown an event which will occur at the Second Coming of Christ and did not occur at the end of the 2300 years in 1844. It is reasonable to conclude that Gabriel’s explanation of the vision of Daniel 8 should extend from Medo-Persia to Christ’s second coming and does not terminate in 1844. Gabriel’s second explanation for the vision is recorded in Daniel 9:21-27 and it is here he first deals with a detailed explanation of the 2300 literal days. He begins with a detailed analysis of the 70 weeks and closes with the “overspreading of abominations . . . even until the consummation, and that determined shall be poured upon the desolate.” Daniel 9:27. The third and last explanation is recorded in Daniel 11:2-13. Each of these three explanations, although covering the same period of time, are somewhat varied in emphasis and detail. Since each of these explanations deal with or extend to the “last end of the indignation” (Daniel 8:19), it is concluded that these time prophecies will be fulfilled at the end of time in literal days. In chapter 7, the three and one half years (times) coincide with the last great oppression of the saints by the “stout” horn just preceding the millennial judgment. In chapter 12 this is reaffirmed by the statement that “he,” the little horn, would “accomplish to scatter the power of the holy people” in three and one half years when all “these wonders” were fulfilled, the last of which was the deliverance and glorification of the living saints. Then, in chapter 8, the sanctuary was to be cleansed at the end of the 2300 days. (See A Word to the Little Flock, p. 12). The last act in the cleansing of the ancient sanctuary was the placing of the sins on the head of the scapegoat and leading him off into the wilderness. This meets its antitype in the banishment of Satan for a thousand years to the desolated earth. GC 422. Again the evidence indicates that the 2300 days extend to the millennium. When Christ was upon the earth, He overcame Satan. This victory, however, was not acknowledged by Satan. After the resurrection he accused Christ, before God, of using His Divinity to overcome him. “Christ’s overcoming and obedience is that of a true human being. In our conclusions, we make many mistakes because of our erroneous views of the human nature of the Lord. When we give to His human nature a power that is not possible for man to have in his conflicts with Satan, we destroy the completeness of His humanity. His imputed grace and power He gives to all who receive Him in faith. Satan demands further evidence that God’s way is indeed just and can be followed by fallen man. Satan is not the only one who is concerned over this matter, the entire universe is! It is God’s character that is on trial and it is the work of the 144,000 to vindicate His character before the universe. See Revelation 14:6, 7; PP 68. God and His law at a time when Satan will come down “having great wrath.” These faithful saints are the only ones who can forever silence Satan’s final argument. Only then will the character of Christ and God the Father be cleared. This will be the true “cleansing of the sanctuary” and it will occur as written at the close of the 2300 days. (See Revelation 21:22; A Word to the Little Flock, p. 12) It is Christ and the Father who are waiting for a “generation” (Matthew 24:34) and this is the reason for the delay in His coming. In Daniel 7:1-8, the prophet is given a vision of four beasts. These beasts represent the four kingdoms of Babylon, Medo-Persia, Greece and Rome. In verses 17 and 18, he is given a brief explanation which fails to satisfy him, Daniel then asks for more specific information in regard to the fourth beast, the stout horn and the judgment. (verses 19-22) Daniel is told that this fourth beast “shall be the fourth kingdom upon the earth” and “shall devour the WHOLE earth.” This fourth beast is the same beast of Revelation 13:1-8 and is also referred to in Revelation 17:3. Note here that ancient Rome could not fulfill this prophecy since she did not devour the WHOLE earth. Daniel 7:25 and Revelation 13:1-8 both refer to the work of little horn and to the same time period of 3 1/2 years, or 42 months. Notice the sequence of Daniel 7:19-22. The same horn made war with the saints and prevailed against them until the Ancient of Days came and judgment was given to the saints. This judgment will occur during the 1,000 years. (GC 661) The context of Daniel 7:19-22 and its explanation, recorded in verses 23-27, place the 3 1/2 years in the future to be immediately followed by the millennial judgment. Daniel’s second and last vision (Daniel 8:2-14) begins with Medo-Persia and closes with the 2300 literal days at the end of time. Verses 16-25 contains Gabriel’s first explanation. In verse 8, (last part) Grecia is broken up into four parts, or divisions. (See verse 22) The little horn which developed out of the disintegration of the Grecian empire was Imperial Rome (later Papal Rome) and is the same horn that arises from the fourth beast of Daniel 7:8. However, the little horn will not be fully developed until the “transgressors are come to the full” and Satan has accomplished the three fold union of Apostate Protestantism, Spiritualism and Catholicism. (See GC 588) At this point he will have established his universal kingdom, Babylon the great. Compare Daniel 8:11-13 with Daniel 12:11, 12. These are the same events. Further explanation will be given in chapter 12. The 2300 day prophecy of verse 14 will meet its ultimate fulfillment in the future for several reasons. Since Gabriel’s explanation of the vision (Daniel 8:2-14) extends to the “last end of the indignation” verse 19 (seventh plague, Revelation 14:9, 10; Isa. 30:30) it can be logically concluded that the vision also covers the same period of time. complete control and will have the power to tread underfoot “both the sanctuary (a symbol representing Christ’s work as the mediator) and the host (God’s people). 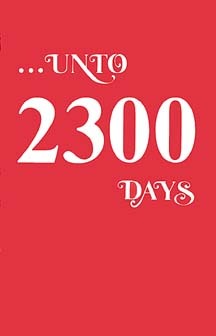 It will be within the framework of the literal 2300 days that these closing events will take place. Chapter 9 begins with Daniel studying the prophecies of Jeremiah regarding the 70 years of the desolation of Jerusalem. Note that Daniel had understood this to be 70 literal years. It was the imminent fulfillment of this prophecy, as well as Daniel’s great love and concern for God, His people, and Jerusalem which prompted his prayer. (Daniel 9:3-19) In this prayer, he confessed his sins, and those of his people. This prayer makes it clear that Daniel understood the great significance of individual as well as corporate sin. He longed for his captive people to bring themselves back to a position where God could again bless them as He had in former times. Today, modern spiritual Israel (the Seventh-Day Adventist organization) is in a similar situation. She longs for the blessings of God and looks forward to His intervention in some marked manner. However, the church cannot expect this to happen in her present spiritual condition. She, like Daniel, must be willing to acknowledge and confess her corporate as well as individual sins. Verses 20-23 indicate that Gabriel interrupted Daniel’s prayer to further explain the previous vision of the 2300 days of chapter 8. God had ordained that the command to deliver His people should follow the 70 year captivity. Therefore, it is significant that Gabriel interrupted Daniel in the midst of his prayer for his people’s deliverance to introduce and explain the first 70 weeks of the 2300 day prophecy. the period of the great shaking within the church. At this time, a polarization among the members will take place. The wise virgins (those with a Philadelphian experience) and the foolish virgins (those in the Laodicean condition) will emerge. See comments on Revelation 3:7-22. The event that will mark the beginning of the 70 weeks (as well as the 2300 days) will be the enactment of the National Sunday law. The “straight testimony” to Laodicea will further widen the gap. (EW 270; Isaiah 40:2, 3) The prophecies of Joel 2 and 3 will also be fulfilled at this time. The expression “thy people” refers to God’s professed people —modern spiritual Israel. “Thy holy city” refers to the wise virgins— God’s true Philadelphian saints within the church. The expression “finish the transgression and make an end of sin” did not find COMPLETE fulfillment at the end of the 490 years, since transgression and sin are still with us. The phrase “to seal up the vision” has reference to the vision that Gabriel mentioned in the preceding chapter, which is the 2300 day vision of Daniel 8. The expression “to seal up the . . . prophet” (See margin in your Bible) has reference to verse 25. When this “prophet” (“the anointed one”) arrives as predicted at the end of the 49 days, or 7 literal weeks, he will be sealed, or sanctioned as the true “anointed one” and will fulfill the prophecies of Malachi 4:5, 6 and TM 475.
beginning of the judgment of the living. (EW 55, This judgment begins at the house of God. (1Peter 4:17; Revelation 11:1, 2; Ezekiel 9) Since Christ did not enter the Most Holy place upon His ascension, the phrase “to anoint the most holy” did not meet its fulfillment during the 490 years. By the close of the 70 weeks, the die within the church will have been cast for both Philadelphia and Laodicea. The wise virgins continue to receive the Holy Spirits influence in preparation for the Loud Cry. In contrast, the foolish virgins (Laodiceans) will be receiving “light and much power” from the arch deceiver thinking that it is the great power of God in their lives. (EW 55, 56) With this “light and much power,” they will give a false loud cry proceeding the appearance of Satan as Christ. “He (God) will take His Holy Spirit from the church and give it to others who will appreciate it . . . The absence of harmony with God becomes apparent, the light grows dim, goes out; the candlestick has been removed.” (Review and Herald, July 16th, 1895. This prophecy meets its fulfillment at the close of the 70 weeks) See EW 55, 56. The division between Daniel 11 and 12 is arbitrary, since there is no actual break in the thought. These two chapters contain a further and more detailed explanation of the vision of chapter 8:2-14. They span history from the time of the Medo-Persians until the glorification of the saints. (See Daniel 12:3) The theme remains the same —the conflict between the little horn and the saints. Daniel 11:2 begins with the great empire of the Persians. Verses 3 and 4 describe the Grecian empire under Alexander the Great, and its later division among his four generals, following his untimely death. Verses 5-15 are a chronicle of the military and political struggles between the kings of the north and south —the Seleucids and the Ptolemy’s, respectively. These two kingdoms emerged from the Grecian empire as dominant powers. Verse 16 introduces Rome for the first time in chapter 11. It was Pompeii who conquered the “glorious land” in 63 B.C. At that time, Palestine was still God’s “glorious land” since the Jewish nation had not yet officially rejected Christ. Verses 17-20 describe the period of the Caesars. The “vile person” of verse 21 was thought to be Tiberius, but history does not support this suggestion. The original version says: “the honour of kingship.” This refers to the transition from the Caesars to the popes. (See Daniel 8:9-12 which also describes the three phases of the little horn as Pagan, Papal and “restored” papacy.) Verse 21 describes the rise and development of the papacy. The early apostolic church would never have considered using the methods described, nor strived for worldly power and position. The “prince of the covenant” of verse 22 refers to the same “prince” mentioned in Daniel 9:26, 27. This “prince” will be the false prophet who will lead Laodicea to its destruction. Verses 23 and 24 chronologically follow verse 21 and describes the quiet beginnings of the papacy. After the rejection of Christ by the Jewish nation, Palestine could no longer be considered the “glorious land,” the geographical center or point of reference for the prophecies involving the kings of the north and the south. (verse 25) The word Israel first applied to the Jewish nation, but following the crucifixion, it now applies to God’s people, irregardless of their nationality or their geographical location. The Old Testament prophecies regarding Israel will meet their primary fulfillment at the end of time with the triumph of the Saints over sin and Satan. Romans 2:28, 29; Galatians 3:29.
caused an internal spiritual breakdown of the Papacy by an attack on its authority and doctrines. The Renaissance reduced the civil and military power of the Papacy through the development of Philosophy and Reason, which led to Atheism. The healing of the deadly wound is yet future. It will occur when the king of the south (Atheism, controlled by the 10 kings of Revelation 17:12-17) and the king of the north (the 3-fold union of Apostate Protestantism, Catholicism and Spiritualism) shall “speak lies at one table,” or make a dishonest agreement. However, in spite of all their efforts, the end (end of the 2300 days) shall be at the time appointed. Following the negotiations with the king of the south (verse 27), the little horn returns to his land with full support from the civil powers (“great riches”). This is the healing of the deadly wound. The little horn, because of his hatred for the holy covenant, influences the two-horned beast (Revelation 13:11) to enact a National Sunday law. The “taking away of the daily” will occur when the little horn attempts to replace the work of Christ on behalf of the sinner. “He shall speak great words against the most High . . . and think to change times and laws (International Sunday Law) and they shall be given into his hand until a time and times and the dividing of time.” (Daniel 7:25) The enactment and the enforcement of the International Sunday law will result in the taking away of the daily. It is the enforcement of the International Sunday law that is the “abomination that maketh desolate.” This International Sunday law is the Beast’s seal, or mark, which the third angel warns against. The worship of the Beast and his image will bring desolation since the seven last plagues will follow. Those that “do wickedly against the covenant” (verse 32) are Laodicea and the “people” that know their God” are His loyal followers, comprised of Smyrnans and Philadelphians. The “exploits” refer to the giving of the Loud Cry. The phrase “time of the end” refers to the 2300 literal days and this process of being “purified made white and tried” will extend until the glorification of the saints (between the 6th and 7th plague). However, there will be no more martyrs after Michael stands up. The 2300 days is an “appointed” or allotted block of time and is still future. There are only two powers described in verses 40-45: the king of the south and the king of the north. The little horn is the subject of verses 36-39 and the pronoun “him” of verse 40 is the correct antecedent. The king of the north is synonymous with the little horn power. The scene describes mounting pressure on “him” —the little horn (the threefold union). The king of the south is militant atheism (communism, or dialectic materialism), which comes at the king of the north (the little horn) at the time of the end. The king of the south is the aggressor and finally causes “him,” the king of the north to go forth with great fury. Note that verses 36-39 are parenthetical and show that the “king of the north” (little horn) becomes all powerful and continues until the saints are delivered. The glorious land, which the little horn enters, represents God’s faithful souls. (See comments on Daniel 11:25) Many of God’s professed people will then give up their faith. The “running to and fro” and the “increase of knowledge” of verse 4 have a far deeper meaning than the development of rapid transit and general increase of knowledge. In verse 6, Daniel asks the question: “How long shall it be to the end of these wonders?” In verse 8, he repeats his question: “O my Lord, what shall be the end of these things?” E.G. White states: “Twice Daniel inquired, how long shall it be to the end of time? . . . 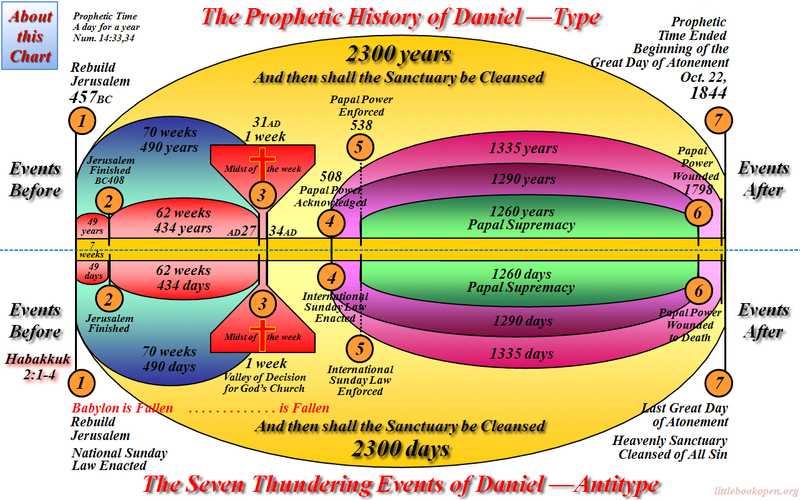 The book of Daniel is unsealed in the revelation to John, and carries us forward to the last scenes of this earth's history” (TM 114 115) This indicates that the book of Daniel has within it the outline for the events that will occur during the last 2300 days of this earth’s history. The “wonders” that Daniel is inquiring about are the scenes of Daniel 11:29-45 and 12:1-3 which he had just been shown. The angel tells him that it will take “time, times and a half” (3 1/2 years, or 1260 literal days) for these events to transpire. Daniel was told that his words were to be sealed up until the “Time of the end” —the literal, 2300 days— when “many shall be purified, and made white and tried.” It will be during this same period of 2300 days that “the wicked (Laodiceans or foolish virgins) shall do wickedly” and none of them will understand Daniel’s vision of the 2300 literal days. See Daniel 12:10. The wise (Smyrnan and Philadelphian virgins) will understand these truths and will be proclaiming them. In Daniel 8:13, the question was asked: “How long shall be the vision concerning the daily and the transgression of desolation, to give both the sanctuary and the host to be trodden under foot?” The answer to this question is found in Daniel 12:11 —1290 days. This time period begins with the taking away of the daily (the enactment of the International Sunday law) and extends for 1290 days to the close of probation (the standing up of Michael). The International Sunday law will be enacted at the beginning of the 1290, but will not be enforced on a worldwide scale (due to the process of law) until the beginning of the 1260. The 1335 days also begins concurrently with the enactment of the International Sunday law (commencement of the 1290) and ends with the glorification of the living saints. Those who endure to the end of the 1335 days will be blessed because they will be one of the 144,000. Note the chain of command by which God communicates with the human race: God the father, Christ, Gabriel, the angels and finally His servants. The book of Revelation, like the book of Daniel, was written primarily for those living in the last days. “He bade John write in a book that which should take place in the closing scenes of this earth’s history.” (MS 129, 1905) Let the student of prophecy always bear in mind that the ultimate fulfillment of the prophecies of Daniel and Revelation is yet future. Over the past centuries many of God’s people have gleaned hope from the writings of God’s word and they would often feel that they were seeing prophecy fulfilled during their generation; however, the ultimate purpose of the prophets visions are for the last generation who will be alive when the controversy ends. See GC 343. The seven stars (verse 20) are the angels of the 7 churches —the spiritual leaders. See Daniel 8:10; 5T 81. The 7 candlesticks are the laity. There have been many views of what constitutes the 7 churches. First, there were 7 actual churches in Asia Minor to whom John addressed these letters. Later, the “churches” have been applied to different periods of the Christian dispensation with certain periods seemingly matching some of the things described in the messages to the 7 churches. But the messages must have a broader and much deeper meaning than just a historical one in order for them to be of value to the last generation. The messages to the 7 churches apply at the end of time and to the individual member as well as the church as a body. The 7 churches contain a profile of the faults and weaknesses, as well as the strengths and positive characteristics of the professed believers. Note that there are only two of these churches that Christ approves of —Smyrna and Philadelphia. The final scenes of the seven churches meet their climax during the literal 2300 days. EPHESUS: Her first spiritual estate was one of Christlike love. However, she allowed herself to develop a legalistic, self-righteous (Laodicean) attitude. The candlestick symbolizes the laity and unless there is a genuine repentance, the spirit of God will be removed from the individual member. SMYRNA: Smyrna has no condemnation leveled against her. She is told that she will face great adversity, persecution and a martyr’s death but she is also promised eternal life. These will be a very special class of saints. They will play a very important part during the 2300 literal days, and will become martyrs as a result of their faith and witness. They will claim the Savior’s promise: “Be thou faithful unto death, and I will give thee a crown of life.” (Revelation 2:10) They are also mentioned in Revelation 20:4 as “the souls . . . that were beheaded for the word of God, and which had not worshipped the beast, neither his image . . .” Since the formation of the “beast and his image” is a future development, the “beheading,” or killing, will have fulfillment in the future. “When the fifth seal was opened, John the Revelator in vision saw beneath the altar the company that were slain for the word of God and the testimony of Jesus Christ. After this came the scenes described in the eighteenth of Revelation, when those who are faithful and true are called out of Babylon.” (Revelation 18:1-5 quoted) (MS 39, 1906) 7a BC 412. The Smyrnan saints will come up in the special resurrection which precedes the literal second coming of Christ. (See comments on Daniel 12:2; GC 637) Smyrna and Philadelphia are those who will suffer at the hands of the “Synagogue of Satan” (finally impenitent Laodicea during the 2300 days). PERGAMOS: Christ, who has the “Sharp sword with two edges” gives admonition to Pergamos because she has allowed Satan’s throne to be set up. “Satan’s seat,” or throne, is established wherever he is concentrating his greatest efforts at that time. The place of his throne has varied throughout history, but He always concentrates in the areas where he can do the most damage to God and where he can most effectively further his goals. Satan has worked with the great kingdoms of earth Babylon, Medo-Persia, Greece and Rome —as well as the large religious movements. Imperial Rome where he persecuted the early Christians. Later, he moved his throne to Papal Rome, where he has carried on his work effectively for many centuries. His next threat came with the Protestant Reformation. These great reformers were spiritual giants and they became the greatest menace to Satan’s kingdom since the time of Christ and the apostles. Following the passing of the Reformers, the churches gradually lost the spirit of the Reformation. Satan was able to so completely control the Protestant movement that by the 1840’s, it also could be called Babylon. After 1844, Satan began moving his emphasis, or seat from apostate Protestantism to Adventism. With the formation of the Advent movement, he worked with untiring diligence against the early pioneers. He knew that this movement had the greatest potential power for destroying him. He has levied one assault after another against the Advent movement until the original purpose and message have become largely lost. Satan has always been very successful in capturing human organizations. Most movements (civil as well as religious) begin with lofty purposes and high ideals, but gradually, as their “founders” and “pioneers” retire and die, the movements undergo a change. As policy and expediency creep in, leadership becomes corrupt and Satan finally takes complete control. This is true of all governments, churches, labor movements and every kind of human organization. It is a mistake for anyone to suppose that his particular church or organization is an exception. This assumption would indicate total lack of honesty with oneself. There are five discernible stages that every movement experiences. B. Next a small group forms around the man and his message. C. With continued growth and success, an organization or a sect develops with the message. The purpose of the organization at this point is only to further the message. D. As the organization gains more and more support, the message becomes secondary to the well-being and success of the organization itself. The “pioneers” who labored and sacrificed to start the movement are now out of the picture, and a managerial class enters the scene. The “message” or “cause” is then used to insure the continued financial support necessary and to further the “corporate goals” of the hierarchy in control. Eventually the organization becomes the “sacred cow” which can do no wrong. Anyone who looks too closely at its deviations from the original intended purposes are labeled as “heretics” and radicals. This process of deterioration is the natural result of the passage of time. E. In the final state, the survival of the organization and its hierarchal structure becomes all important and all consuming. In this deteriorated state, the message can easily be sacrificed or modified to insure the survival of the organization. Another recent example would be the recommendation to capitulate that was given by the General Conference to the Seventh-day Adventist church in Germany during the governments under Kaiser and Hitler. It will be during the 70 literal weeks that the SDA organization will have reached its final state of apostasy. It is then that Satan, working through the deceived leadership (blind Laodicea), for all practical purposes gains complete control. (See comments on Daniel 9) This will be a difficult time for many who have been under the control of the system for so many years and have allowed men to do their thinking. But the Master said that we must be willing to take up His cross and follow Him. Within the organization, there are those of Pergamos using the methods of Balaam who taught Balac the most effective methods of destroying Israel. In a spiritual sense, the phrase “to eat things sacrificed to idols” means to eat or accept human transitory ideals as a substitute for the absolute values of Christ. At this point, the organization itself becomes an idol. “Unsanctified ministers are arraying themselves against God. They are praising Christ and the god of this world in the same breath . . . Satan has made his boast of what he can do. He thinks to dissolve the unity which Christ prayed might exist in His church. He says, “I will go forth and be a lying spirit to deceive those that I can, to criticize, and condemn, and falsify.” Let the son of deceit and false witness be entertained by a church that has had great light, great evidence, and that church will discard the message the Lord has sent, and receive the most unreasonable assertions and false suppositions and false theories. Satan laughs at their folly; for he knows what truth is. Those who abandon the doctrine of Balaam and refuse to eat “things sacrificed to idols” will be permitted to eat the hidden manna —the correct understanding of the truths of the scriptures (primarily Daniel and Revelation). The white stone given by Christ to the overcomer is a symbolic acknowledgment of acceptance. Anciently, this was practiced to indicate acceptance. THYATIRA: Those with a spiritual condition comparable to this church have many fine traits. But a serious problem faces Thyatira, involving Jezebel and the fornication and adultery which many are committing. In Elijah’s time, Jezebel was a prophetess of Baal and the wife of wicked king Ahab. It was she who brought the prophets of Baal to Israel to establish false worship leading Israel into deep apostasy. SARDIS: Again, the message of Sardis applies to the leadership. (See TM 357, 358; MS 81, 1900; 7a BC 403; RH, August 20, 1903) Note that both Sardis and Laodicea receive no commendation from Christ. PHILADELPHIA: Philadelphia, like Smyrna, receives no reproof. It is Christ who has the key of David, and it is he who sets before the believer an “open door,” or an open mind. A true Philadelphian is painfully aware of his lack of strength and realizes his need for divine power. He is not boastful about his spiritual accomplishments and does not parade his “righteousness” for he is fully aware of his true nature. The main characteristic which sets Philadelphia apart is complete loyalty to God. The “Synagogue of Satan” (Laodicea following the 70 weeks) is again mentioned here (refer to comments on Smyrna). The “Temple,” which the 144,000 Philadelphians are to be pillars in, is actually “the Lord God Almighty and the Lamb.” (Revelation 21:22; A Word to the Little Flock, p. 12) They are supporting pillars because they are the “supporting evidence” that God’s way is possible and that perfect loyalty to Him can be accomplished. Since his rebellion and fall from heaven, Satan has claimed that God’s law cannot be kept. It is really God and his system that are on trial before all creation. Christ came to reveal the Father’s character and to show that the law can be kept through perfect faith in God. But after the cross, Satan charged that Christ used Divinity unavailable to the ordinary person to overcome sin when on this earth. Since it is true that Christ has been the only one so far to live in perfect obedience to God, Satan’s charge against God has gone undisputed. So, after the cross, God had to develop a new plan for defending his character. The only way that he will be proven a just and true God is through the development of a generation of 144,000 LOYAL people who will stand without a Mediator. These saints are His witnesses at the hour of His (God’s) judgment and by vindicating His character, they will forever settle the arguments of Satan. When the saints are glorified, Christ can say “It is done” and can then put His sickle to the harvest (or resurrect the saints of past ages) for He has the “first fruits” of the Wavesheaf —the 144,000. (See Revelation 14:4) The 144,000 are all Philadelphians, they are loyal and will be translated without seeing death. See COL 69. The scenes depicted here indicate the necessary preparation that will take place in heaven before the 2300 days. God’s people must have light and understanding in order to intelligently cooperate with Him as He moves through the various phases of the literal 2300 days. God’s faithful ones must keep pace with this light. (See 5T 80) The church cannot rest on what the pioneers discovered, but must press on and discover deeper and broader spiritual meaning from God’s word (specifically Daniel and Revelation). Ezekiel 2 and 3 describe the “straight testimony” that will be given to Laodicea during the literal 70 weeks of Daniel 9:24. The early chapters of Ezekiel set the stage for the events of the 7 seals and 7 trumpets, which will transpire during the 2300 literal days. “The fifth chapter of Revelation needs to be closely studied. It is of great importance to those who shall act a part in the work of God for these last days.” (9T 267) This statement indicates that the 7 seals are future events. In verse 1, John sees God the father holding a sealed book in His right hand, which no one is able to unseal but Christ. This sealed book contains the prophecies of Daniel, which are intended for God’s people who will “act a part” at the end of time. The time when the Jewish leaders will see the awesome results of their choice in rejecting Christ will be between the 6th and 7th seal at the time of the special resurrection. (See GC 637; Revelation 1:7; Daniel 12:2) The Laodicean SDA organization is following in the steps of ancient Israel and the sins which caused the ruination of Israel will also cause its downfall. THE FIRST SEAL— THE WHITE HORSE: The White horse symbolizes God’s true people who will be going forth “conquering and to conquer.” This phrase —conquering and to conquer— indicates the momentum that the giving of the true message will have. It will gain momentum at the beginning of the Midnight Cry (beginning of the 2300 days) and will reach its peak at the glorification of the 144,000 between the 6th and 7th plagues. The expressions “taking peace from the earth” and “they should kill one another” again depicts the strife which will arise as the result of the National and later me International Sunday laws. THE THIRD SEAL— THE BLACK HORSE: The third seal describes the time of the judgment for the living. THE FIFTH SEAL— THE MARTYRS: E.G. White places the fifth seal at the time of the Loud Cry of Revelation 18. “When the 5th seal was open, John the Revelator in vision saw beneath the altar the company that were slain for the word of God and the testimony of Jesus Christ (Smyrna). After this scene came the scenes described in the 18th of Revelation, when those who are faithful and true are called out of Babylon.” (MS 39, 1906; RH December 21, 1897; 7A 412) Persecution, betrayal and martyrdom will be the lot of many of God’s faithful souls during the 2300 days. The blood of the Smyrnan martyrs will again be the “seeds of the reformation.” The example made of their lives will be instrumental in bringing those of God’s people who are still in Babylon under the banner of Christ. Notice also “that they should rest yet for a little season, until their fellow servants also and their brethren, that should be killed as they were, should be accomplished.” There will be martyrs for their faith during the 70 weeks as well as during the 1260 days. Thus the expression “should rest yet a little season” is appropriate. “The powers of heaven (sun, moon and stars) will be shaken by the voice of God. The sun, moon and stars will be moved out of their places. They will not pass away, but be shaken by the voice of God.” (EW 41) This describes what will take place at the time of the 6th seal. Matthew 24:29-34 is a parallel passage to the sixth seal of Revelation 6:12-17. In verses 13-17 is depicted another group who are very special in God’s sight. They are seen as having “come out of great tribulation” (See Daniel 12:1; Matthew 24:21) and who have washed their robes, and made them white in the blood of the Lamb. They have received the “white raiment” from Christ and have all become Philadelphians. These are the 144,000, and they serve Him in His temple day and night. Verse 1 describes the opening of the 7th seal. The 144,000 of chapter 7:1-8 will be sealed and glorified between the 6th and 7th seal. The seven trumpets are judgments which fall upon unrepentant Laodicea, following the close of the 70 weeks. (See 9T 97) God will employ every means possible to enlighten Laodicea, but like their counterpart, Ancient Israel, many will still reject Christ’s invitation. the first apartment of the sanctuary in heaven. (See GC 414) He went into the Most Holy Place in 1844 to begin the judgment of the dead. The judgment of the living is future and will begin with the enactment of the National Sunday Law at the beginning of the 2300 days, and will not be finished until every person has been given the opportunity to choose between Christ and the mark of the Beast. THE FIRST TRUMPET: The first angel will sound after the 70 weeks. “Hail and fire mingled with blood” will follow. This “fire mingled with blood” certainly does not refer to the “sacred fire” of God’s own kindling. It refers instead to the “strange fire” of man’s and Satan’s making. The mention of a “third part” refers to segments of the church, and does not necessarily mean exact “thirds” by amounts or number. THE SECOND TRUMPET: When the second angel sounds, John sees “as it were a great mountain burning with fire was cast into the sea.” At the close of the 70 weeks, the Laodicean Seventh-day Adventist organization will have “officially” closed its own probation by their rejection of God’s “light.” Laodicea will have then become a very important part of the closing scenes as she fully cooperates with Satan. Laodicean leadership, like the Jewish leaders, will have hardened their hearts against the Holy Spirit and will align themselves fully with Satan, thinking that they are doing God’s will. “I saw the nominal church and nominal Adventists (SDA), like Judas, would betray us to the Catholics to obtain their influence to come against the truth. The saints (faithful souls who will have separated from Laodicea by the close of the 70 weeks) then will be an obscure people, little known to the Catholics.” (Spaulding-Magan Collection. A vision at Dorchester, Maine, October 23, 1850) This vision will meet its fulfillment in the future during the 2300 literal days. Out of this “smoke” will come locus with great power, but they will only be permitted to torment “those men which have not the seal of God in their foreheads.” They were not allowed to “hurt the grass of the earth, neither any green thing, neither any tree.” In Revelation 8:7, a “third of the trees were burnt up, and all the green grass was burnt up.” The “trees” and “grass” of Revelation 8 refer specifically to those within Adventism who will be caught up and deceived by Satan’s devices during the 70 weeks. The “trees” and “grass” of chapter 9 refer to those in Babylon who will not have had an opportunity to accept or reject light, since the Loud Cry will not have taken place yet. Satan can and will “torment them (Laodiceans who have not the seal of God in their foreheads) five months,” but will not allow them to be killed. They will be his most efficient agents as “they become the most bitter enemies of their former brethren.” (GC 608) These deceived ones will believe that this anguish of spirit is the time of “Jacob’s trouble” and that the second coming and “deliverance” is just before them. THE SIXTH TRUMPET: The second woe, or the 6th trumpet, describes the reaction of Babylon to Laodicea’s false loud cry. The four angels which have been restraining the Euphrates river, or the people of Babylon, are released at the standing up of Michael. The “hour, the day, the month and the year” mentioned here refers to a specific time when probation for the world will close. The events spoken of above will occur during the literal 2300 days, and especially during the 1260 days when Satan will come as Christ and when the saints will be giving the Loud Cry. The light contained in the seven thunders has been sealed up until the time of the end —the time of the literal 2300 days. This light will be vital to God’s people who will be giving the Loud Cry. The “little book” will be “in thy mouth sweet as honey,” but bitter in the stomach since the message contained within will bring on much persecution once it is preached and understood. Verse 11 refers to the time of the “Loud Cry” of the third angel. Revelation 11 is a brief synopsis of the entire 2300 days, beginning with the judgment of the SDA organization and ending with the 7th plague and the Second Coming. Verse 1 parallels with Daniel 9:24-27. The command to “rise and measure the temple of God and the altar” will be the time for the judgment, or measuring of the corporate body of the Seventh-day Adventist church. (See Zechariah 2:1, 2) Since only living people are capable of “worshipping therein, this cannot refer to the judgment of the dead in 1844. The “measuring rod” is God’s truth and His law. TM 17; 209. The National Sunday Law will be the catalyst that will polarize the SDA organization as a corporate body. This will mark the beginning of the first segment of the 2300 days —the 70 weeks. John was told to leave out and not measure the “outer court,” or the “Gentiles” (Babylon). It will not be until the enforcement of the International Sunday Law, followed by the Loud Cry that the “Gentiles” will be made fully aware of the issues in the controversy. At this time they will be given the opportunity to make their decision for or against truth. Since the 2 witnesses are types of Moses and Elijah, verses 5 and 6 are symbolic of the end result of the rejection of their message. At the same time as the great earthquake, the last remaining unfaithful will fall from the “city.” This is the second woe (or 6th trumpet). The city here refers to the 144,000 —those remaining from spiritual Jerusalem after the death of the Smyrnans. Until the voice of God sounds, there will be some who appear to be a part of the 144,000, but God knows their hearts, and they will not be glorified. The 24 elders fall upon their faces and worship God since the problem of sin is over and their places in heaven are eternally secured. The 24 elders, as well as all the other translated and resurrected saints who are now in heaven, are there on the condition that the 144,000 will overcome as Christ overcame. The time of the “lightnings, and voices, and thunderings and an earthquake, and great hail” is a description of the closing events caused by the voice of God between the 6th and 7th plagues. Revelation 12 is a recap of the entire 2300 days, ending with the glorification of the 144,000. The 2300 days cannot begin, nor the first seal be opened, until Christ is certain that he can develop 144,000 loyal saints in one generation. (Revelation 5:1-5) When Christ sees that His “woman,” or true church is ready, it will be a “wonder,” or a signal that Christ can allow the 2300 days to begin. “His church is to be a temple built after the divine similitude . . . and polished to shine as an emblem of heaven, radiating in all directions the bright, clear beams of the Sun of Righteousness.” (TM 17) The woman’s “clothing of sun” symbolizes the righteousness she receives from Christ. It will be when the man child, Christ, is fully and perfectly reproduced in the 144,000 that the words of Christ in Matthew 24:34 will meet their fulfillment. “Verily I say unto you, this generation shall not pass, till all these things be fulfilled.” Notice that “all these things,” which Christ is referring to in the previous part of the chapter, are closing events which will occur in their order during the 2300 literal days. Notice that this dragon has “seven heads and ten horns, and seven crowns upon his head.” This cannot refer to the fall of angels, for their fall was long before the formation of the dragon with seven heads and ten horns. This beast will be fully developed when the threefold union is completed, just preceding the Loud Cry. The tail of the dragon symbolizes the false prophets that will arise, as they did in Isaiah’s time. “For the people turneth not unto him that smiteth them, neither do they seek the Lord of hosts. Therefore, the Lord will cut off from Israel head and tail, branch and rush, in one day. The ancient and honourable, he is the head; and the prophet that teacheth lies, he is the tail.” (Isaiah 9:13-15; Daniel 9:26, 27) “Any many false prophets shall rise, and shall deceive many.” (Matthew 24:11) These “fallen stars” then become active agents of Satan and “men of talent and pleasing address, who once rejoiced in the truth, employ their powers to deceive and mislead souls.” (GC 608) It will be these “fallen stars” (Laodiceans) who will stand with the dragon before the women (true church), ready to devour her child (the 144,000) as soon as it is born. The woman (verse 6) will flee into the wilderness (the hostile kingdom of Babylon) to give the Loud Cry. She will be preserved because of her understanding and loyalty, (Revelation 11:3) for 1260 days (or 42 months; see Revelation 13:5; 11:2). During the 1260 days of the Loud Cry there will be multitudes of faithful Smyrnans who will be martyred and will come up in the special resurrection at the close of the 2300 days. These will be resurrected at the voice of God, but will not be a part of the 144,000. Christ and Satan have had an ongoing conflict since iniquity was first found in Satan. (Isaiah 14) Verses 7-9 describe the final battle that will be fought between Christ and Satan. The war will be won when Christ develops the 144,000. If Christ fails to do so, Satan will prove true his claim that it is impossible for fallen man to demonstrate perfect faith and loyalty to God. In effect, God and Christ would appear as liars, with the earth under Satan’s full control and the universe “up for grabs.” When the above concepts are understood, the delay of Christ’s second coming can be reasonably explained. He will not allow the closing events to begin until He can be certain that He can develop 144,000. They will have an intelligent faith and understand clearly the issues involved in the controversy. wrath against all who are faithful to God. Satan knows “that he hath but a short time” for he understands the prophecies of the 1260 days as well as the 2300 days. Verse 11. The saints during the 2300 days will overcome him by “the blood of the lamb, and by the word of their testimony.” They will have a true understanding of justification by faith, and will be allowing Christ to perfectly reproduce His character in their lives. They “loved not their lives unto the death” indicates that they will be willing to die for their faith. See Revelation 6:9-11. Verse 13. When the dragon (Satan) sees that he is cast to the earth by Christ’s decree to restore and build Spiritual Jerusalem, he begins his persecution of the woman (church) who has “brought forth the man child.” This woman or “church” will be the faithful souls (AA 11) who have allowed Christ’s character to be perfectly reproduced in them. See COL 69. Verse 14. The woman will be cared for by the special power and protection of God. The 3 1/2 years is the same time period as verse 6, and will be the time following the International Sunday Law when all the world wanders after the beast. Revelation 13:3-5.
destroy the faith of just one of these, he will be the victor of Christ. The expression “keep the commandments of God and have the testimony of Jesus Christ” describes the character of the 144,000. “The Sabbath question will be the issue in the great conflict in which all the world will act a part. (Revelation 13:4-8, 10 quoted) THIS ENTIRE CHAPTER IS A REVELATION OF WHAT WILL SURELY TAKE PLACE. (7a BC 423) This chapter contains two separate segments (verses 1-10 and 11-18), each giving an overview of the 2300 days. The beast in verse 1 is the same beast mentioned in Daniel 7 and in Revelation 12:3. John sees this beast as it will appear in its fully developed state, with its deadly wound healed. This composite beast has components from previous kingdoms, all of which Satan has created. To this beast, Satan will give power, a seat and great authority. In verse 3, John also was given a view of its past when “one of its heads seemed to have a mortal wound, but its mortal wound was healed.” (RSV) It was the Protestant reformation which inflicted a mortal wound upon one of the beast’s heads (the Papacy), and it will be the development of the threefold union which will ultimately heal the wound. The deadly wound will be healed just prior to the beginning of the 42 months by the personal appearance of Satan as an angel of light. During the 42 months, ALL the world will follow the beast with great admiration. (verses 4, 5) This beast power will blaspheme against God by claiming to be Christ and changing the Sabbath to Sunday. See GC 624. Verses 7 and 8 describe the 42 month period of the Loud Cry which will be initiated by the International Sunday Law, and accompanied by persecution. Verses 11-18 contain another outline of the 2300 days, focusing on the two-horned beast. John is shown” another beast coming up out of the earth (the first beast came out of the sea) and he had two horns like a lamb, and he spake as a dragon.” This clearly is symbolic of the rise of Protestant America. The first five verses describe the character and experience of the 144,000 after their translation when they are in heaven. The 144,000 have not been defiled with women, (apostate churches, including Laodicea). They have not been swayed by the corrupting influences of the harlot mother or her daughters. who will be alive during the 2300 days. The first angel’s message (verse 6) will resound throughout the earth to “every nation, and kindred, and tongue and people” and it contains the “everlasting gospel.” (See Matthew 24:14) The injunction is to “Fear God, and give glory to Him; for the hour of His judgment is come.” In order for the individual to be part of the solution, he must direct his attention away from human organizations and human leadership, relying only on God’s word, as interpreted by His spirit. The call to “worship him who made heaven and earth and sea and the springs of water” is actually a restatement of the 4th commandment. During the entire 2300 days, the Sabbath will be the key test of loyalty to God. This will be in direct contrast with the Sunday sabbath. The first angel’s message will parallel the beginning of the 2300 days but will continue on and will be very relevant during the Loud Cry. After the enactment of the National Sunday Law, the SDA church will be forced to make a corporate decision on the Sabbath question. By the end of the 70 weeks, this decision will have been made. It will be primarily during the 1260 days that the individual, after being presented with the standardized test (International Sunday Law), will make his or her decision. complete fall is yet future since she has not yet made all nations drink of the wine of the wrath of her fornication. The following vision describes the time of the second angel’s message and especially stresses the fact that unless the 144,000 survive the 2300 days, “Israel” will be lost. “I saw that we must wake up, wake, and cry earnestly for the arm of the Lord to be revealed. It is fatal to sleep now. Time is almost finished. I saw that is was a shame for us to refer to the scattering for examples to govern us now in the gathering time; for if God does no more for us now than He did then, we shall never be gathered. In the scattering, Israel were torn and smitten, but now God will bind up and heal them. I saw that God had stretched out His hand the second time to recover the remnant of His people. They are these who have been covered up in the “rubbish” since 1844. I saw that efforts to spread the truth should now be put forth, such as in 1843 and 1844. In the scattering, efforts to spread the truth had but little effect —accomplished but little or nothing— but now in the gathering time, when God has set His hand to gather His People, efforts to spread the truth will have their designed effect; and all should be zealous and united in the work. I saw that a paper was needed, and all should feel interested in it. I saw that the truth should be made plain upon tables, that the earth and the fullness thereof is the Lord’s, and that necessary means should not be spared to make it plain. I saw that the old chart was directed by the Lord, and that not a figure of it should be altered except by inspiration. I saw that the figures of the chart were as God would have them, and that His hand was over and hid a mistake in some of the figures, so that none should see it till His hand was removed. I saw that the two-horned beast had a dragon’s mouth, and that his power was in his head, and that the decree would go out of his mouth. Then I saw the Mother of Harlots; that the mother was not the daughters; but separate and distinct from them. She had had her day, and it is past, and her daughters, the Protestant sects, were the next to come on the stage and act out the same mind that the mother had when she persecuted the saints. I saw that as the mother had been declining in power, the daughters had been growing, and soon they will exercise the power once exercised by the mother. I saw the nominal church and nominal Adventists, like Judas, would betray us to the Catholics to obtain their influence to come against the truth. The saints then will be an obscure people, little known to the Catholics; but the churches and nominal Adventists who know of our faith and customs (for they hated us on account of the Sabbath, for they could not refute it) will betray the saints and report them to the Catholics as those who disregard the institutions of the people; that is, that they keep the Sabbath, and disregard Sunday. finished, He will come to the door of the first apartment, and confess the sins of Israel upon the head of the Scape Goat. Then He will put on the garments of vengeance. Then the plagues will come upon the wicked; and they do not come till Jesus puts on that garment, and takes his place upon the great white cloud. Then while the plagues are falling, the Scape Goat is being led away. He makes a mighty struggle to escape, but he is held fast by the hand that leads him. If he should effect his escape, Israel would lose their lives. I saw that it would take time to lead away the Scape Goat into the land of forgetfulness after the sins were put on his head. The great white cloud I saw was not the holy place, but entirely separate from the holy and most holy place, entirely separate from the sanctuary. Verse 12 describes the faithful Philadelphians and Smyrnans. Verses 15 and 16 describe the time of the glorification of the 144,000 when they, the first fruits, are fully developed. Thus will be fulfilled Christ’s words, “for the earth bringeth forth fruit of herself; first the blade, then the ear, after that the full corn in the ear. But when the fruit is brought forth, immediately he (Christ) putteth in the sickle, because the harvest is come.” (Mark 4:26-30) This represents the “reaping” of the 144,000 followed by the resurrection of the righteous dead of all ages. Verses 17-20 describe the ultimate destruction of the wicked at the second coming of Christ. John is next shown the seven angels in heaven who will administer the 7 last plagues. Verses 2-4 give a view of the 144,000 in the earth made new. (GC 648, 449) At first reading the discussion of the saints already in the new earth seems out of context and irrelevant to the 7 last plagues; however, the 7 last plagues cannot be considered apart from the 144,000. If God should fail to develop the 144,000, a pouring out of his wrath would be unjustified anger —an arbitrary act— which would be totally out of character for God. By the end of the 1260 days when Christ sees that he has his faithful group, it will then be time for the 7 last plagues to be poured out. “No man was able to enter the temple, till the seven plagues of the seven angels were fulfilled.” Only the 144,000 will be qualified to enter the temple, but they must first experience the wrath of God in the plagues. “But of the times and the seasons, brethren, ye have no need that I write unto you . . . For yourselves know perfectly well that the day of the Lord (time of the 7 last plagues) so cometh as a thief in the night. For when they (the worshippers of the beast and his image) shall say, Peace and safety; then sudden destruction cometh upon them, as travail upon a woman with child; and they shall not escape.” (1Thessalonians 5:1-3) The 7 last plagues will be a surprise only to those who have rejected the Loud Cry and who are ignorant of the sequence of events during the 2300 days. Verses 2-7 describe specific plagues and their effects on the wicked. The causes cannot be directly linked with a definite outside force or phenomena at this time. The last four plagues can logically be explained as a result of the earth increasing in rotational velocity to the point that it leaves its orbit. A reasonable explanation for the sun to be shining “in its fullness” at midnight would be a sudden rapid acceleration of the earth’s rotation. The “righteous behold with solemn joy the tokens of their deliverance” because they have anticipated these events. This would indicate that God’s people will be knowledgeable of every move that he makes because they understand the time prophecies of Daniel and Revelation and know the sequence of events. In contrast the wicked who have ignored the truths of Daniel and Revelation, will be filled with “terror and amazement.” A sudden acceleration would also explain the “streams ceasing to flow,” since this would cause decreased gravitational effect. If the earth should “be removed” (Psalms 46:2) from its normal path it could pass closer to the sun, causing the temperature of the earth to increase, “scorching men with fire” —the fourth plague. As it continues moving through space, moving away from the sun, the beast finds its kingdom in darkness —the fifth plague. By this time, the beast’s kingdom is the whole earth. The drying up of the Euphrates will not in itself “prepare the way for the kings of the east,” but it is significant because it will be one of the last events which must occur before Christ can come. face with total annihilation, but they are delivered by the voice of God. Verse 15 speaks directly to the 144,000. This battle of Armageddon will be Satan’s last opportunity. If he can kill or cause to fall even one of the 144,000 he will claim the victory over Christ. As the seventh angel pours out his vial into the air (verse 17), a “great voice” is heard from heaven, saying, “It is done.” This is the time of the deliverance of the saints by the voice of God. God and Christ are the victors and His Kingdom is restored. Verse 19 describes the dissolving of the threefold union as a result of the 7th plague. The great whore has many abominations but the “abomination that maketh desolate” describes the time when the great whore causes the kings of the earth to enact and enforce the International Sunday Law. (See Daniel 8:13; 12:11; Matthew 24:15) It will be this abomination which will lead to the desolation of the earth as a result of the 7 last plagues. The “Abomination of desolation” continues for 1290 days. (Daniel 12:11) It begins with the enactment of the International Sunday Law, and closes with the standing up of Michael. In verse 7, John is given an explanation of the woman and the beast. The beast is symbolic of the universal church-state government which Satan will inspire men to form. The angel said that the beast “was and is not, and is to come” (RSV) This apparent paradox becomes very clear when it is applied to the last days, as it was originally intended. In the past, the beast achieved universal power in the known world through the kingdoms of Babylon, Medo-Persia, Greece, Imperial Rome and Papal Rome. This is the beast that was. The seven heads, seven mountains and seven kings are all synonymous symbols for the seven consecutive universal church-state powers that have supported the beast. In each of his empires, Satan has incorporated the “woman,” or spiritual aspect as an integral part of the system. A government or political power cannot survive for long without a dogma or belief to hold the support of the masses. The two great errors —the immortality of the soul and sun worship have been a prominent part of each succeeding kingdom because they in effect abolish the first four commandments. The first 5 kings (kingdoms) who are fallen again represent Babylon, Medo-Persia, Greece, Imperial Rome, and Papal Rome. the 42 months, when the beast will have the full civil and religious support necessary to enact an International Sunday Law. The beast “that was and is not” is the eighth, but it belongs to the seven and goes to perdition. This “eighth” king is actually Satan. He is the driving force behind all seven of these universal kingdoms. Satan has worked very well with the natural human tendency for control and power and it is this concept of universality that permeate all 7 kingdoms. This universal power will make “war on the Lamb” by trying to prevent the giving of the Loud Cry, and eventually enacting a death penalty. The “woman” which thou sawest is that great city, Babylon. See Revelation 16:19. Revelation 18 is the time when the Loud Cry will be given during the 1260 days. The Loud Cry of the third angel (verses 1-8) will not be given until that time. The fall of Babylon is not yet complete since ALL nations have not yet drunk of the wine of her fornication. Babylon’s plagues are to come in “one day.” (verse 8) The phrases “day, hour, and half-hour” should not be interpreted in terms of “prophetic” time, the conversion of days into years. In this instance, a short span of time is indicated, not one year. Verse 9-23 describe the final fall of Babylon. Verse 24 describes the Smyrnans who will be martyred during the Loud Cry. At the glorification, the bride (144,000) will be ready for the marriage of the Lamb. In verse 8 is described the fine linen, or “righteousness” that the saints have received. The 144,000 will fulfill verse 10. “I was pointed down to the time when the third angel’s message was closing. The power of God had rested upon His people; they had accomplished their work and were prepared for the trying hour before them. They had received the latter rain, or refreshing from the presence of the Lord, and the living testimony had been revived. The last great warning had sounded everywhere, and it had stirred up and enraged the inhabitants of the earth who would not receive the message.” EW 279. Verses 11-16 portray a graphic description of the literal second coming of Christ, which will occur between the 6th and 7th plagues. This will be the battle of Armageddon. Christ will come after the saints are tested, sealed and glorified. Verse 1-3 describes the time following the close of the 2300 days, when Satan will be exiled, or confined to this planet for 1,000 years. Satan and his angels will not be destroyed by Christ’s second coming. They will not literally be “chained” but since all the wicked are now dead, Satan will have no humans to tempt; He is “imprisoned” on the earth by circumstance. Verse 4. It will be the redeemed whom John saw seated upon the thrones and “judgment was given unto them.” The “souls of them that were beheaded for the witness of Jesus, and which had not worshipped the beast, neither his image” are the Smyrnans which will die as martyrs during the 2300 days. They will come up in the special resurrection. See GC 637. Those who will choose to remain in the Laodicean condition will arise at the second resurrection at the close of the 1,000 years. Satan will be loosed from his “chains” at the close of the millennium by the resurrection of the wicked. He will then convince them that they have the power to take the Holy City. Verses 11-15 describe the final judgment and destruction of the wicked. John is given a view of “a new heaven and a new earth” following the destruction of Satan and his followers. This verse is a logical continuation of Revelation 20:15. The holy city will be brought to the earth at the close of the 1,000 years and will be preserved in spite of all the efforts of Satan and his followers to capture it. The city will also endure the lake of fire which will melt even the very elements. The “Lamb’s wife” or the “bride” will be the 144,000. The “guests” will be me redeemed from all ages. The Holy City was shown to John in all its splendor and beauty. (verses 10-21) The City will be a community of saints from all generations, beginning with Adam. In verse 22, notice that John “saw no temple therein; for me Lord God Almighty and the Lamb are the temple of it.” E. G. White says: “I believe the Sanctuary to be cleansed at the end of the 2300 days is the New Jerusalem Temple, of which Christ is a minister.” (A Word to the Little Flock, p. 12) It was Satan’s rebellion which first began polluting the “sanctuary,” or God’s name, with his lies and misrepresentation of God’s character. Christ came to reveal the true character of the Father, but it will be the privilege of the 144,000 to reveal to all that it is possible to reflect the image of Christ fully. It will be in this way that the 144,000 will “cleanse” the Temple (God and Christ) of all charges which Satan has made against them. The true understanding of the sanctuary and what constitutes its cleansing relation to the 2300 days will be the foundation and central pillar of me Loud Cry. Verses 23-27 describe the beautiful “life style” of the redeemed. Chapter 22 is literal and descriptive of the new earth, the home of the redeemed. Laodicea closes her probation as an organization by her rejection of present truth. or false prophet, Matthew 24:11, confirms “the covenant with many for one week.” (Daniel 9:27) and also destroys the “city and the sanctuary.” vs. 26 B. 2. Brings on the desolation of Laodicea by leading her to accept the abomination of desolation, the mark of the beast. See Daniel 9:26, 27. C.
“The fact that there is no controversy or agitation among God’s people, should not be regarded as conclusive evidence that they are holding fast to sound doctrine. There is reason to fear that they may not be clearly discerning between truth and error. 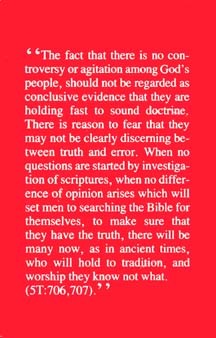 When no questions are stated by investigation of scriptures, when no difference of opinion arises which will set men to searching the Bible for themselves, to make sure that they have the truth, there will be many now, as in ancient times, who will hold to tradition, and worship they know not what.” (5T 706, 707). but is provided to help the reader better understand type and antitype of Daniel. Click here for a larger view of the Mirror Chart. Click here for further study and commentary on the Mirror chart.